The Opposition accused the Maharashtra government of being "anti-farmer" and "indifferent" to their plight. Amid an agitation by farmers' outfits demanding higher procurement prices for milk, the Opposition today created ruckus on the issue and, siding with the agitators, walked out of the Maharashtra Assembly. The government hit back by stating that it was farmers groups, led by MP Raju Shetti-headed Swabhimani Shetkari Sanghatana, which were "anti-farmer". The government claimed that it was not peasants, but federations representing them that have stopped milk supply which in turn was causing "loss" to farmers. While the members from the Congress and the NCP shouted slogans against the government, Assembly Speaker Haribhau Bagade said that he would ask Chief Minister Devendra Fadnavis to convene a meeting tomorrow to discuss the issues raised. "The government is not serious towards the demands raised by the farmers, but we are with them," he added. Vikhe-Patil, without naming anyone, alleged that "capitalists" had decided to damage the businesses of dairy farmers and end the co-operative movement. "The Shiv Sena is doing theatrics. Walk out of the government if you are serious," Vikhe-Patil said, pointing towards Shiv Sena legislators in the House. Mr Pawar too charged the Shiv Sena with "hoodwinking" armers on the issue. 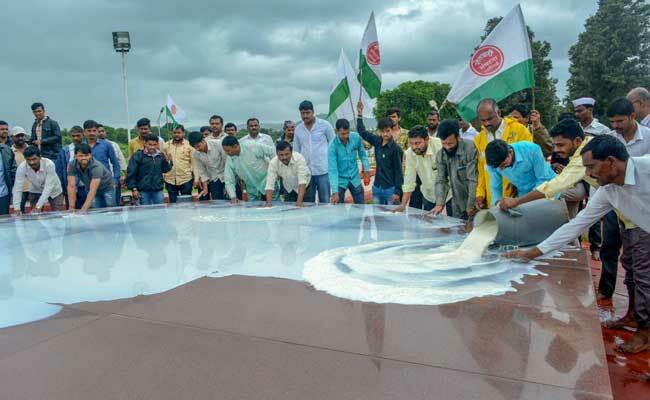 Countering the Oppositions attack, lawmaker Chandrakant Patil noted that it was the bodies representing dairy farmers, and not the farmers, who have launched the protest on the issue. "This is an anti-farmer protest. Milk collection and supply to cities should begin. The government will not allow (any disturbance)," Mr Patil said. Meanwhile, state minister Ravindra Waikar, also a Shiv Sena legislator, hit back at the opposition parties over the "double standard" jibe directed at his party. "Like one sees everything in a yellow hue afte contracting jaundice, the opposition too blames the Shiv Sena over every issue," Mr Waikar countered.